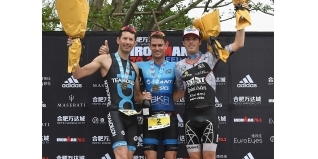 While not the first Ironman or Ironman 70.3 events to be held in China, Sunday's IRONMAN 70.3 Hefei represented the beginning of a new era in the country, with Ironman now under the ownership of the Chinese Wanda Sports holding company. With further events in Xiamen (November) and another three races starting in 2017 (Liuzhou, Quijing and Chongqing), the brand is certainly moving ahead swiftly with the roll-out and development of the sport in China. The Hefei event also had the added attraction of 50 qualifying slots to Kona - one of the few opportunities to qualify over the 70.3 distance. A $25,000 Pro purse was also in place to attract the Pro's, and making the long journey worthwhile were Stuart Hayes and Emma Pallant, who both took second place and collected $2,750 for their efforts. New Zealand's Graham O'Graday (22:56) headed out the swim, holding a 20 second lead over Jesper Svensson (SWE), with Luke Bell (AUS), Hao Mia (CHN), Brad Kahlefeldt (AUS), Evgenii Khabarov (RUS) and Stuart Hayes around 60 seconds down on the Kiwi. O'Grady continued to lead from the front through the full 90km, but after losing almost four minutes in the water it was Brad Williams (USA) who reached T2 with a deficit of just one minute, with another hard-riding New Zealander, Dougal Allen, also recovering from a sluggish swim to reach T2 in third. Now close on six minutes down on the leader, the group of Kahlefeldt, Svensson, Hayes, Bell and Mikolaj Luft (POL) arrived together. Would the leading trio pay for their efforts on the bike? O'Grady continued to lead from the front on the run, but behind the chasers were closing fast and by 15km, Brad Kahlefeldt had reversed his T2 position to move into the lead. Hayes was running well too and he would move through to second, while the long-time leader O'Grady really suffered over the final couple of kilometres and would eventually finish down in seventh, with Brad Williams rewarded for his fastest bike split effort with third place overall, just five seconds clear of Luke Bell. That result adds to previous 70.3 podium finishes this year for Stuart Hayes in Weymouth,Zell am See and Malaysia. The small Pro women's field was headed out of the swim by Heather Lendway (USA), with the experienced Radka Vodickova (CZE) just a few seconds down. They had both gained an advantage of just over one minute on two-time World Duathlon Champion, Emma Pallant. Great Britain's other representative, Parys Edwards, was six minutes down on the leader at this point but no doubt looking forward to her strongest disciplines to come. Most of those gaps were eliminated on the bike, with T2 seeing the arrival of Robin Pomeroy (USA), Vodickova, Lendway and Pallant all within seconds, with Edwards now eight minutes down. While Pallant took the lead on the run early, by the midway point Vodickova had regained first place and at the 12km marker they were separated by just 10 seconds. The Czech athlete was able to push on and extend her lead with the fastest run of the day, 1:22:59 versus the 1:25:56 of Pallant, with Pomeroy completing the podium. While she didn't make the podium this time, Edwards can certainly be pleased with her closing half marathon of 1:24:28.